For the most efficient and smooth ride, all four tires should hit the road in exactly the same way – from tire pressure to rotation and balance. Low tire pressure has a negative impact on the fuel economy of your vehicle and shortens the life of your tires. Under-inflated tires have more surface area on the road, causing more resistance and drag which reduces your miles per gallon. To get the longest life out of your tires, it is important to schedule regular tire rotations. Because tires can wear unevenly with normal driving, rotating the tires allows the wear to even out and prevent bald and worn spots. This service rotates the tires in position on your vehicle, from front to back or diagonally. Manufacturers usually recommend this service every 5,000 miles, but you may need it sooner depending on driving habits, road conditions, and tires. 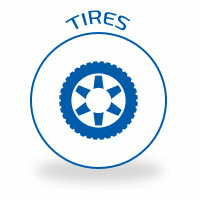 Tire balancing also helps to provide a smooth ride and extend the life of your tires. Small imperfections on the wheel, including the valve stem, can affect the way the wheel and tire hit the road. A small weight on the wheel provides the additional weight needed to balance the wheel and tire. This service reduces excessive wear on your tires and creates a smooth ride for you and your passengers! If you have questions about the condition of your vehicle’s tires, tire rotation or balance services, or the best care for your vehicle, call the expert technicians at our Alabaster, AL auto repair shop: 205.663.6088.